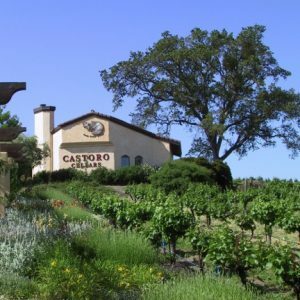 Our tasting room is located in the heart of the Paso Robles appellation on scenic Highway 46 West to Highway 1 and the likes of Cambria, Hearst Castle and the magnificent Big Sur coastline. Situated in the middle of our Cobble Creek Vineyard, the walk through the long grape arbor to the gardens above is breathtaking. The gardens feature lush native plants and specimen cork oaks. The views of the surrounding hills and vineyards offer a great place to picnic and enjoy a glass of wine. Inside our Mediterranean styled tasting room there is always a varied selection of new releases, single vineyard and library wines to enjoy. Additionally, featured are local artisan products, interesting gifts and gourmet food items. Throughout the year we host concerts for musicians from around the world. During the summer the shows are held outside with the vineyard and sunset as the backdrop. Other events include; the Zinfandel Festival in March, the Paso Robles Wine Festival in May and the Harvest Wine Tour in October.